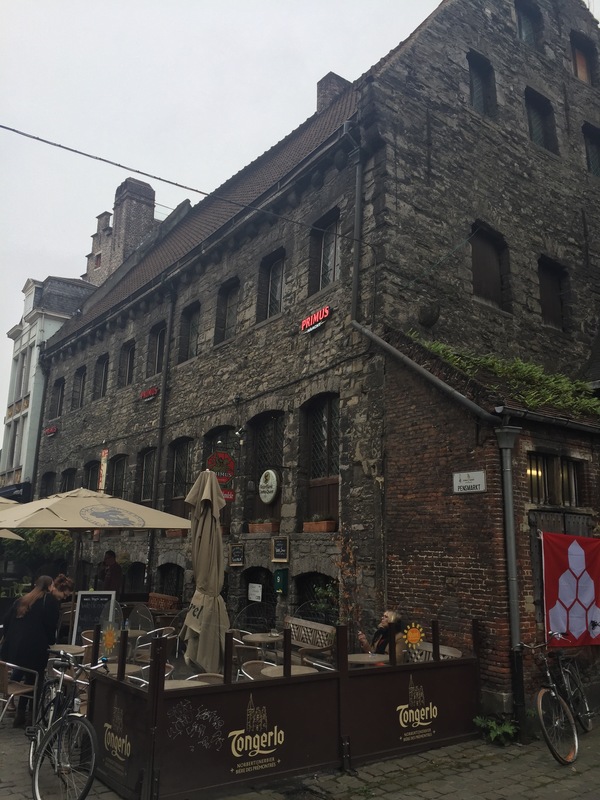 Kortrijk and Ghent….Domingo y lunes in Bélgica. On Sunday Siska and I started our day with a visit to her home town. Kortrijk is a Flemish city located in the province of West Flanders. I was able to see where she and Stephan are from, the hospital where her Dad worked his whole life, the house Stephan was raised in, and the school that she went to. We than met Stephans brother Jeff, his beautiful wife Delphine, and their 9 year old twins for lunch. We went to a stunning restaurant named ‘Het Wit Kasteel’. Not only was the food and ambiance spectacular, but the owners have a whole set-up going on to entertain the children. There was an actual on-site playground for the kids and a clown that came to entertain them for hours. And everyone employed at this restaurant looked like they belonged on a cover of a magazine. Seriously the most attractive restaurant staff that I have ever seen…and I have been in a lot of restaurants, to put it mildly. I had the greatest time ever at lunch and laughed the entire time! Stephan was still out of town on business and he was dearly missed. Siska’s best friend, also named Delphine, stopped in to see Siska with her son. It was just a fantastic day. Jeff taught me a great deal of history and we discussed everything from their hunting season to my mid life crisis. (Jeff I am laughing out loud as I write this!). 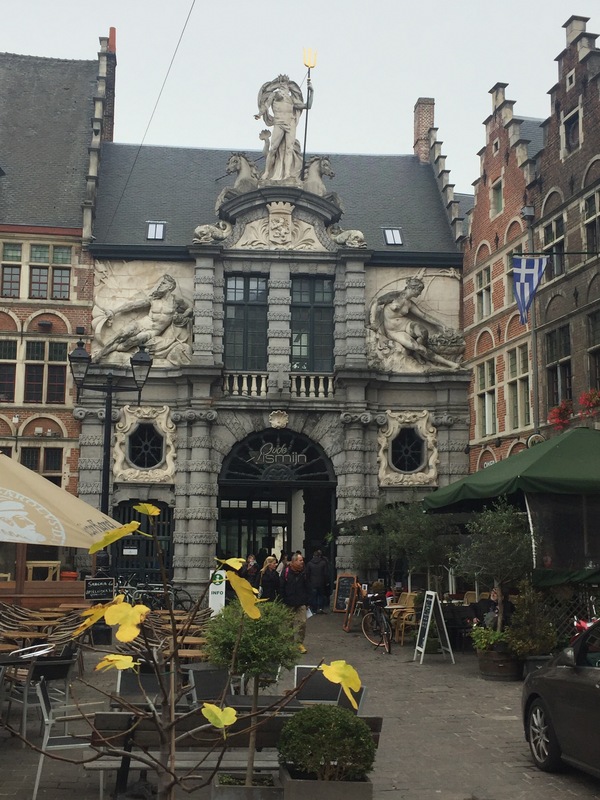 On the face of it all, in 1302 the Flemish people grew tired of paying taxes to the French. At the time, Bruge had the unshared rights on sheeps wool that was imported from England. The trade was intrusted with the towns people until the King of England, Edward 1, began to deal in a beeline with the customers. The traders than lost their advantage. ‘Philip the Fair’ of France than was brought current on this situation and set up his troops in Bruges. Well, the Flemish were not having this. On the night on May 18th 1302, Pieter de Coninck, a weaver from Bruges and Jan Breydel, a butcher from Bruges, organized the townsmen. The men were instructed to go door to door knocking and when the home owner answered the door to ask them “Schild en Vriend”. This means ‘Shield and Friend’ and is called a ‘Shibboleth’. A ‘Shibboleth’ is a word whose pronunciation is used to differentiate one group of people from another. These words are too difficult for the French to pronounce on the first try. (Similar to me, trying to roll my R’s my first month in España). Some 2,000 people were taken by the Flemish militia during this nocturnal massacre. This went down in history as the ‘Matins of Bruges’. Quickly, the civil militias of several Flemish cities were fabricated in anticipation of the counter attack of the French. The Flemish dug several ditches all around the field in Kortrijk, that was already surrounded my marshy ground. The Flemish had placed themselves in a strong defensive position for when the French calvalry arrived. Soon the French were falling off their horses and into the ‘Goedendag’ of the Flemish. Jeff explained to me that the ‘Goedendag’ was a simple weapon to fabricate and is basically just a combination of a club and a spear. Simple or not, it did the trick. The Flemish won this battle and then went to all the fallen French knights taking over 700 pair of Spurs from them to hang in their church. Hence, ‘The Battle of the Golden Spurs’. Sadly, the French came back 80 years later and took their Spurs back. But, we are not going to discuss that. After lunch I was coerced into ordering a ‘Dame Blanche’ for dessert. This means ‘the white lady’ and is the name used to describe the Belgian dessert of vanilla ice cream, whipped cream and molten chocolate. And, it was sooo delicious. After a nice long, relaxing lunch, Siska brought me to see ‘The Towers of Broel’. 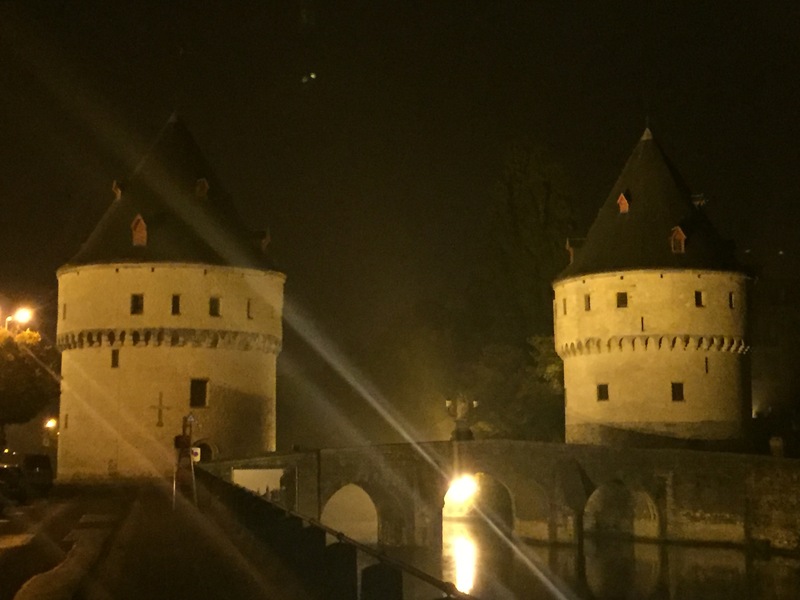 These two beautiful towers are a very important symbol to the city and have definitely passed the test of time as they guard the river bridge. We than make our way home. We are picking Stephan up at the airport in the morning and going to ‘Ghent’ for lunch. 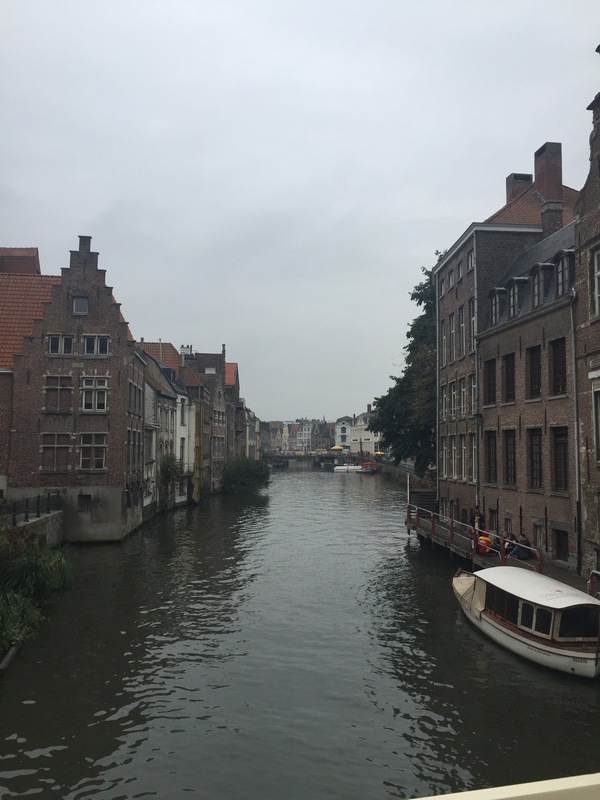 After retrieving Stephan from the airport, we head straight to Ghent on a mission to race through the city and see as many sights as possible, buy chocolates, and have lunch. My flight was leaving at 9:00 at night and this ‘Renair’ airline insists that you arrive two hours before your departure time. 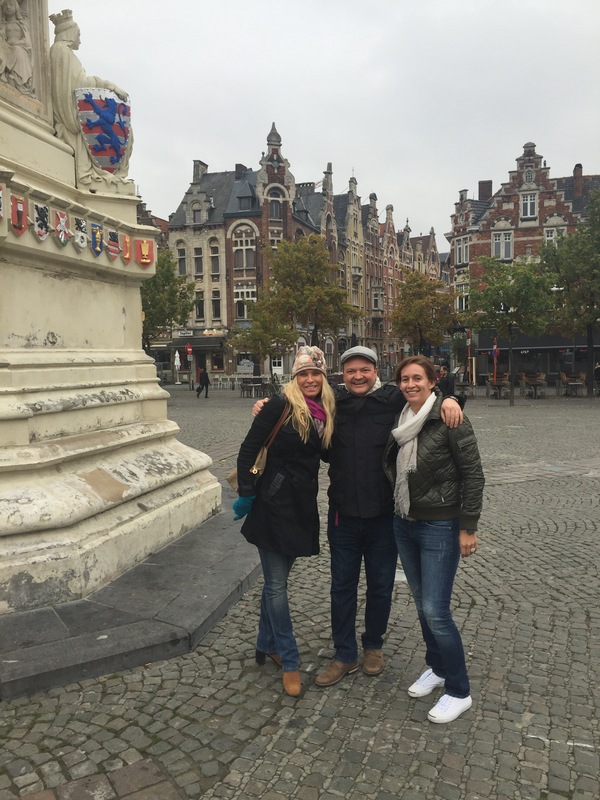 Stephan, Siska, and I in Ghent. Our first stop happened to be when we stumbled on ‘The Big Cannon’ or ‘Mad Meg’. 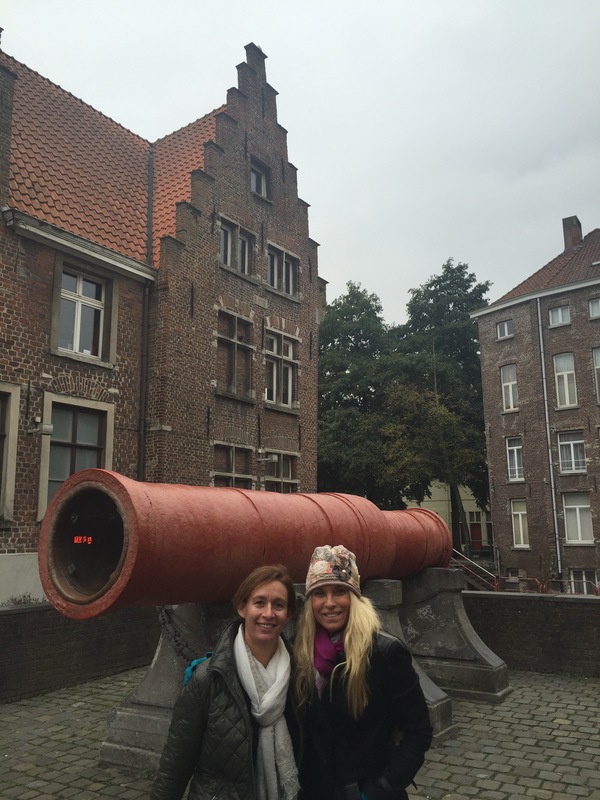 This cannon was brought to Ghent in 1578 in defense against the Spanish. It proved to be completely useless and has resided in its current location ever since. Atleast this is the version of the story as I have heard it. No one seems to care too much about ‘Mad Meg’ so I haven’t pushed the issue. Siska and I in front of ‘Mad Meg’. 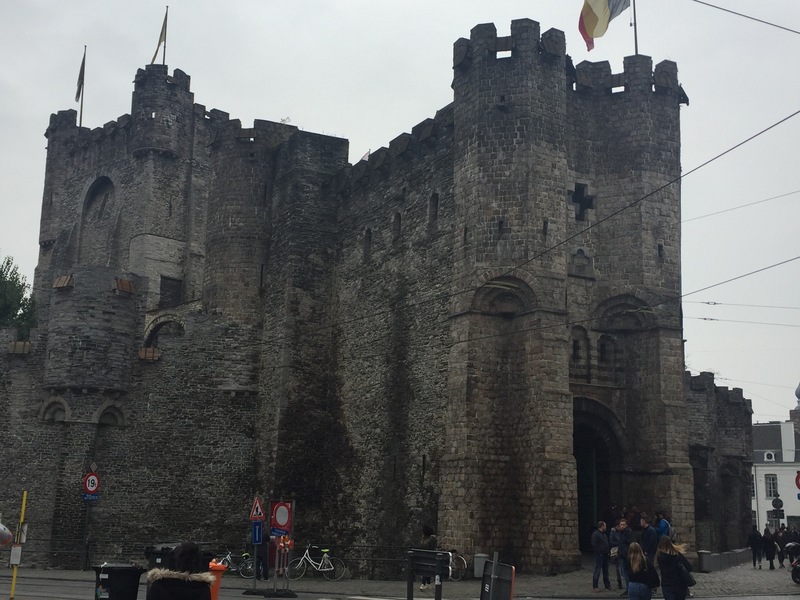 As we continued to make our way toward lunch, we stopped by the ‘Gravensteen Castle’. This is a impressive castle built in 1180. It was constructed to appear reminiscent of the ‘crusaders castles’ that ‘Philip of Alsace’ encountered when he participated in the second crusade. The crusades were a series of religious wars warranted by the Catholic Church. This castle had served as a prison, a courthouse, a factory and it was nearly demolished before it was restored in 1885. Now it is used as a museum to showcase torture devices, such as the guillotine. The Gravensteen Castle in Ghent. We head over the St. Michaels Bridge, stopping along the way to eat these delectable little candies called ‘Cuberdon’s’. This is a ‘Cuberdon’. It is a delicious candy that is extremely addictive and can only be found in Ghent. These ‘Cuberdon’s’ are made out of the hardened sap of the acacia tree. 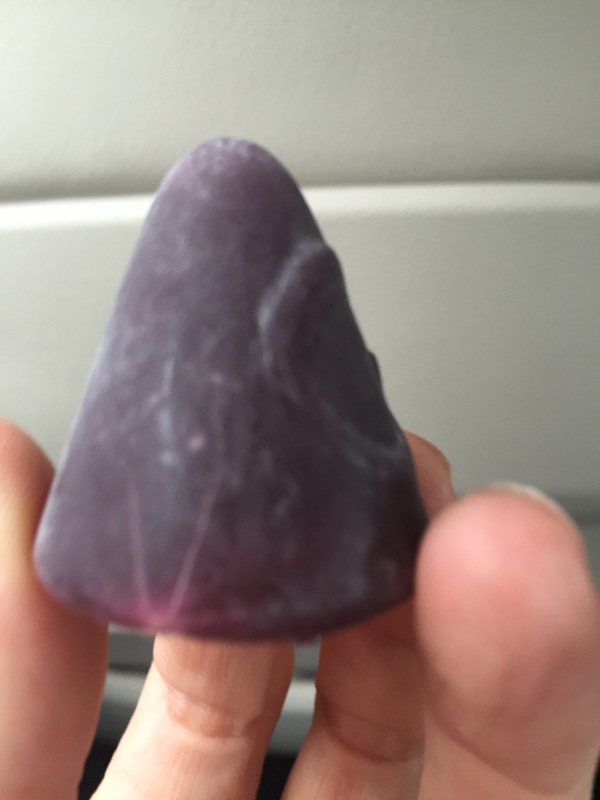 They are purple, they taste like raspberries and they are really, really, really good! Some stories say that it was created by a member of clergy and other stories say it was a science experiment of a pharmacist in Ghent. Either way, I could eat them all day long! 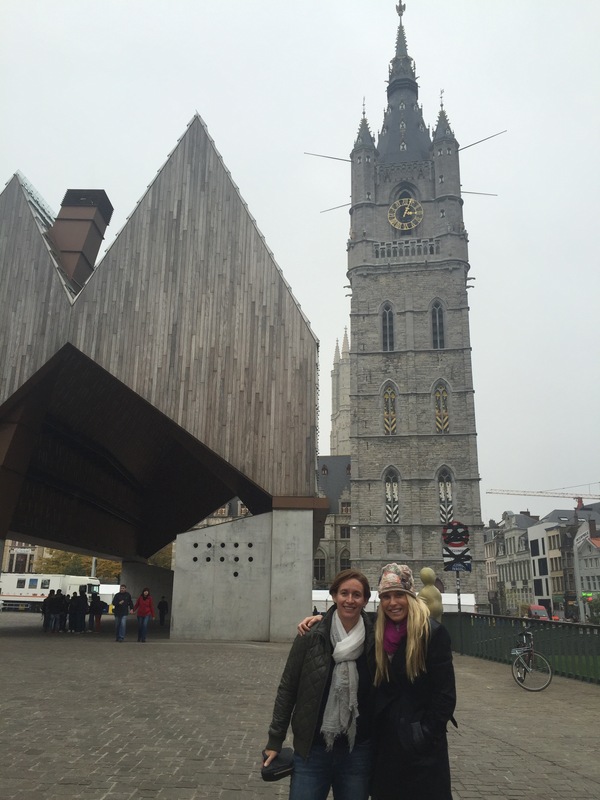 We ran by many beautiful Cathedral’s, and enjoyed so many amazing views of the ‘Graslei and Korenlei’. The ‘Graslei and Korenlei’ is a beautiful mideval port lined with historical buildings that really look like they belong on candy cane lane. We arrived at a georgeous restaurant called ‘Elga Ueen’. I never did get the story from Siska and Stephan as to how they decided on this particular place. Notwithstanding, it was very good. The oysters were exceptionally delicious. Super briny. Tasting just like the sea, just how I like them. It was time for me to say good bye to my friends and catch my train to the airport. One train + one bus + one airplane + one taxi and I was back at home at Gloria and Pablo’s in Sevilla. And, now, as much as I hate to get out of Belgium, I really must get back to my studies here in España.